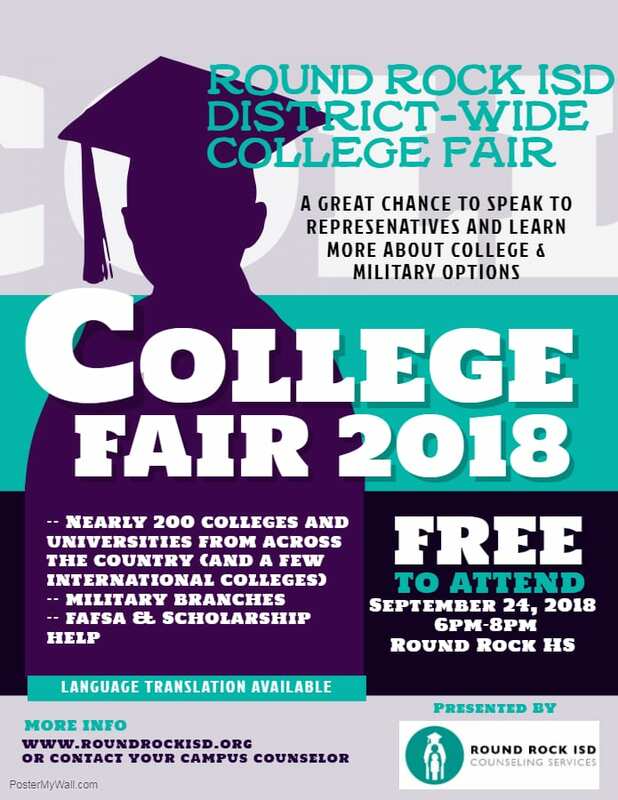 Attend central Texas’ largest college fair on Monday, Sept. 24 at Round Rock High School, 201 Deep Wood Dr., in Round Rock from 6 p.m. to 8 p.m.
Over 200 college and university representatives from across the country, with some international representation, will be in attendance along with branches of our armed services. Learn more about higher education choices, admissions, financial aid, and scholarships. Before the event, students are encouraged to register for the college fair on the gotocollegefairs.com website. Select the TACRAO 9/24/18 – 9/28/18 All Central Texas and Rio Grande Valley Fairs event. Registered students will receive a unique barcode to present to college fair representatives. At the fair, college representatives can scan the student’s unique barcode to get acquainted with the student’s information.